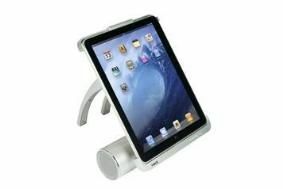 Logic3 boosts range with six i-Station docks for iPad, iPhone and iPod | What Hi-Fi? There are two designs for the iPad: the i-Station Podium shown here, and the i-Station Base. The Podium is a cylindrical stereo speaker system/charger with a rotating mount so the iPad can be viewed in landscape or portrait mode as required. It also includes a free app with a clock, calendar, internet radio, alarm function, voice recorder, EQ control and photo album. The Podium costs £70. Alternatively you could plump for the Base, a simple rectangular block which your iPad slots into. Like the Podium, it plays and recharges simultaneously and comes with the same free app for £60. If you're an iPhone or iPod owner, there are four new i-Station models to choose from: the £100 Combo with built-in CD player; the £100 SoundBar with 30W stereo speaker system, FM radio and composite or component video connection; the £70 i-Station26 compact 2.1 FM radio dock with subwoofer; and finally the £35 i-Station Lite with alarm clock and FM radio. All models are available from major retailers including HMV, Micro Anvika, Next, Amazon and Play.com.